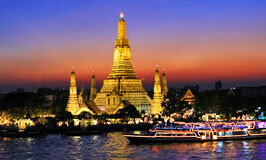 Discover Bangkok's beautiful, gleaming temples and the magnificent Grand Palace. Get lost in ancient Siamese history with a river cruise to the famous ruins of Ayuthaya, the Kingdom's former capital. Experience the novelty and fun of a floating market, or apply your bargaining skills for some unbeatable prices in the stifling heat of the weekend market. Cycle around hidden trails for a completely different experience… But whatever you do, make sure to arrive in Bangkok with a zest to explore, and to make the most of every minute in this magical metropolis. This year my sister Sathya, my mother (from Buenos Aires) and me, are the people who will plan the travel, but be sure that if we can plan everything, we are going to work with Exotic India Escapes again, because the last year everything was perfect. Hi Ashish, We are so sorry that could not write you earlier. When we reached to NY we had severe jet lag. As we just started to recover we were hit by Sandy Storm and a week later by Snow storm. We were without electricity for 2 weeks, had no phone and we still have no internet. This was the worst storm we were hit with. Thank God we had no damage to house or personnel. I just want to let you know that we had a great trip. This was almost perfect. The Guides and the drivers were excellent. Car was comfortable. The hotels were great. Above all this trip was unique, different than others. We would have never seen these places otherwise. Each place has something different and unique in culture. People were so nice all over.This was a great package. I would recommend it to all ages, young or old. The best part of trip was plan ride to see Himalyas, what an experience.We thankyou so much. I told Mr Batra to promote this Trip. If we can do any thing please let us know. Next year we want to see temples of South. With kind regards. Dear Mr Gupta Thank very much for evreything that you do for us ,its was wonderful ,realy it was a dream you treat us lik kings. I am glad you wrote to ask about this! It was wonderful. We really enjoyed all the hotels (especially the Imperial hotel) and the tours given by Enille. He took us to different sites in Delhi including the Ghandi memorial site, and a couple of tombs, as well as the Qatar Mintub, which was reported to be the tallest stone structure. The drive to Agra was interesting to the say the least and certainly put things in perspective when you saw the stark contrast between the poor and everyone else. There was nothing to see in Agra other than the Taj Mahal but the hotel was beautiful so we just enjoyed that when we were not at the taj. The food was spectacular at all the places but it did not prevent us from getting Delhi belly!!! We suffered through no problem though... And the spa was absolutely gorgeous and soooo relaxing. The food was great and the weather could not have been better. I only did one Ayervedic treatment, which was nice but Gustavo just enjoyed the ambiance of the place, as did I. We really liked it and ended up wishing we had stayed there longer, especially with the long drive to/from Mangalore, but it was worth it!! I would recommend this trip to anyone!! We both really enjoyed it but will need to save our $$$ for awhile after that trip!!! Thanks you!!! © Email: email Call Ashish Gupta: +91 9899413714, +91 9958308506 Inquiries / Orders: We have reps accross Exotic India Travels makes no claim over Maharajas' Express trademark and logo and they are the properties of their owners. The Official website of IRCTC Maharajas Express is www.the-maharajas.com .